I just arrived at my cousins place for weekend and I found a dumb system here with an expired version of windows . I had to Google for the solution from my mobile and I found it . Then the thought aroused in my mind about the users like my cousin , who don't activate windows and shut their computers up once they get the blue screen . I m just writng this post to help these guys. Lets start with a simple introduction of this problem !! To prevent the piracy of it's operating systems , Microsoft introduced " Windows Genuine Advantage " along with " Product Activation " requirement to prevent multiple computers from using the same Key . If you can't activate your copy of Windows, you will be left with a 30 day grace period to change your product key to one that is fully valid or activate it through internet or Contact Microsoft for assistance. Once your grace period of 30 days is completed , Windows will refuse to login anymore and it will just show a bluescreen asking you to activate your copy of Windows . The first solution is provided by Tomorrow Times Blog . This solution lets you gain access to your files with enough functionality to surf the web, talk on MSN Messenger, and load up most of your applications. Note that it won't offer you full functionality of Windows , but it will be enough to get your job done until you can find the time to activate your Windows. Follow the steps below to Bypass Windows Activation Screen . It will popup a dialogue asking you to activate windows . Click Yes and then a Blue Windows activation screen " Lets Activate Windows " will popup. Now While holding down the Windows Key on your keyboard , press the "U" key also simultaneously . This will open up the Narrator program to assist those with poor vision. It is this way that will let us go and access our Windows . In the Title bar of Narrator window i.e at the top left corner , Once can find a icon which looks like a little computer as marked red in the figure . Click on the icon and a drop down menu will open . 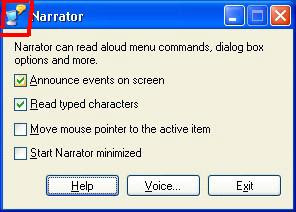 Now choose About Narrator form the menu .A dialogue windows About Narrator will popup . In the windows , In this window, there you can find the text "Microsoft Web site". Click on it and it will open up your Internet Explorer taking you to the Microsoft Accessibility website . Now type C: in the address bar of the Internet Explorer window that has opened and hit enter , to gain access to the C disk drive . From here you ca navigate in your computer , loading specific programs, and do most of your work . As I told you earlier , some program's won't work until your copy of windows is activated . You won't have a Task Bar at the bottom of your screen, as trying to open it will just result in shutting down of PC a few moments later. But MSN messenger will work . It has been confirmed that this one really works . Don't forget to check Digital life solution to bypass Windows Genuine Advantage check for accessing windows update . very nice layout and template i see. you did it yourself?? coool..
there is a registry file available for validating your windows..its available on internet. If you have firefox, click tools, downloads, and then click the desktop icon to have temporary but full access to your computer. This let me burn some of my files onto dvds and re-install the OS. How to start Narrator if you don't have a "Windows Key" on your keyboard? I had no internet connection so could not validate. I just called the phone number, it was all automated and they gave me the activation code over the phone.